Stone for your response to my query about good nurseries in California. 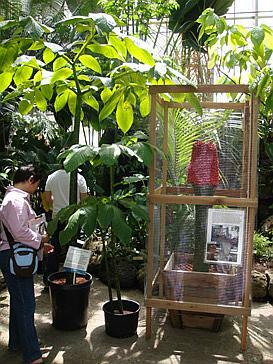 the A. titanum in fruit on display there. Attached are photos to share with you. closed-circuit security camera. The 2nd photo shows a close-up of the fruits. Seed under lock and key? They must have heard you were coming, George! Thanks for sharing these remarkable photos with all of us. It is amazing to see an infructesence of this rare species in cultivation surrounded by a ''security wall'' for its protection! Jim Symon would be SO proud to see his ''grandkids'' (or "great-grandkids"?) developing, actually they look NEARLY ripe! A question---does anyone know where the pollen was obtained to ''do the deed'' on this plant?? In other words, who is the ''baby daddy'' to these fruits! > Stone for your response to my query about good nurseries in California. > the A. titanum in fruit on display there. > Attached are photos to share with you. > closed-circuit security camera. The 2nd photo shows a close-up of the fruits. First of all, thank you Tom Vincze, Dan Levin, Tsuh Yang, and Jason Stone for your response to my query about good nurseries in California. I didn't find any, but I did go to the UC Berkeley's botanical garden. I couldn't make it to the plant sale but I was able to see the A. titanum in fruit on display there. Note that it was under lock and key, and FYI, closely guarded by a closed-circuit security camera. 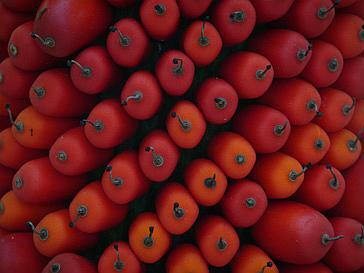 The 2nd photo shows a close-up of the fruits. > I didn't find any, but I did go to the UC Berkeley's botanical garden. > I couldn't make it to the plant sale but I was able to see the A. > titanum in fruit on display there.